You are here: Home > Pain & Injury Center > Sports & General Info > What is Pulsed Electromagnetic Field Therapy? The use of magnets to aid a patient’s recovery was used by the Chinese as far back as 2000 B.C., and noted by the Greek physician Galen around 200 B.C. Over the years its popularity has waxed and waned, and was for a time only used by vets, usually treating broken bones in racehorses. Horses showed a remarkable increase in strength and endurance following electromagnetic therapy, and scientists began to investigate its use for humans. In 1971, the successful healing of a nonunion fracture was achieved through the use of 10 microamps of direct current delivered via electrodes. 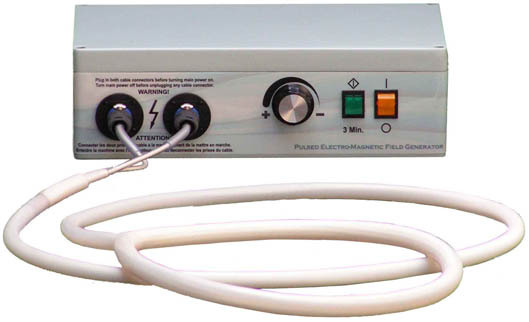 Pulsed electromagnetic field therapy (PEMFT), also known as pulsed magnetic therapy, pulse magnetotherapy or PEMF, is a non-invasive treatment used in many applications, particularly orthopedics, pain relief, and swelling. It has the benefits of being drug-free and without side effects, and does not interact with prescribed medicines. Each magnetic pulse produces a tiny electrical charge, which, it is claimed, affects the cell membrane, allowing channels to open so that nutrients may enter and waste leave with greater efficiency. PEMFT is believed to shut down the inflammatory response in the body. According to many, it also increases ATP production. ATP is a chemical used by the body for energy, hence the demonstrated increased power of the racehorses. However, increased production of ATP depends upon the magnetic current staying below 500 microamps. Any higher than that, and ATP production drops. Cells of the same type join to form tissue, and similar tissues form organs. Restoring or improving cell function increases overall function of the body, so optimizing cell function increases the possibility of healing. Bones, in common with other body tissues, contain electrical properties. A pulsing magnetic field applied to a bone causes very small movements that result in tiny electrical charges within the bone cells, which is believed to stimulate the cells into regenerating. PEMFT is being used as a supplemental therapy in cases where broken bones have failed to fuse, or are taking longer than normal to mend. As well as orthopedic applications, PEMFT is being used to treat injured or swollen tissues such as backs or shoulders, joints, scars, and even cancer, where it has effectively reduced pain and, in some cases, reduced tumor size. Used for post-operative pain relief in cosmetic surgery, patients have reported half as much pain as other patients who did not use the technology. Successful treatment can depend on the intensity (measured in Tesla) and frequency (pulses per second, measured in Hertz) of the magnetic pulses. The most beneficial range for people is between 1 and 50 Hertz. Efficiency rapidly decreases when Hertz levels reach 100-200. Although studies are not complete on the optimum intensity and frequency for particular applications, it is known that the pulse will not be able to penetrate to deeper areas of the body if the magnetic field is too weak. There are several patches, mats, and other devices available for the home use of pulsed electromagnetic field therapy, which may be an effective adjunct to the treatment of your painful joints and muscles. Please visit these product links for additional treatment options.